Plus Size Kitten: Instagram Crazy Makan Pics & Win A U9 Phone! camwhoring food eating pics on instragram? Economy is BAD so I am going to "rajin" join Facebook and Instagram contests to win myself some prizes. It seems so easy for those pros who has been wining so many things from movie tickets to iPad! I saw this contest from Ninetology Malaysia Facebook and though to myself, alright how hard it is to show a crazy makan picture and win a phone with dining vouchers! I'm going to be thinking hard how to get some crazy pictures out there. Sharing is caring, if u think u got some crazy makan pictures just instagram #makantology and #ninetologyIG (don't forget to follow Ninetology Malaysia) and it's not that guy name Eric Wong who has nickname himself ninetology. This competition is open to residents of Malaysia of all ages, except for employees of Ninetology Marketing Sdn. Bhd. their families or anyone else associated with this competition. All entrants must be a follower of NinetologyMy on Instagram. Entrants who are not followers will not be counted. Entries must be submitted by via Instagram. 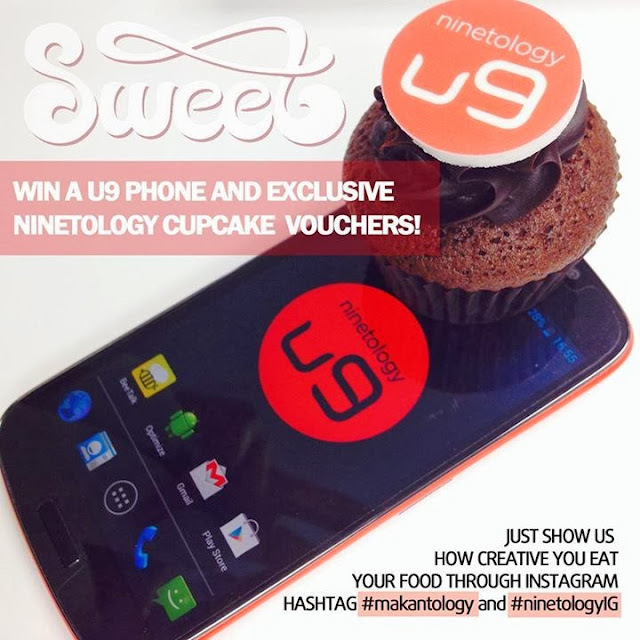 Entries must be hash-tagged with #makantology and #ninetologyIG. The winner will be announced after seven days of the closing date of the competition (The closing date for the contest is midnight on DECEMBER 15th 2013). Copyright in all images submitted for this competition remains with the respective entrants. However, in consideration of them providing for the Competition, each entrant grants a worldwide, irrevocable, perpetual licence to Ninetology Marketing Sdn. Bhd to feature any or all of the submitted images in any of their publications, their websites and/or in any promotional material connected to this competition. Entrants may submit as many photos as they wish. Late, illegible, incomplete, defaced or corrupt entries will not be accepted. No responsibility can be accepted for lost entries and proof of transmission will not be accepted as proof of receipt. Entries must not be sent through agencies or third parties. MOST LIKES - Most likes on Instagram contest post. *Terms and Conditions are subjected to change upon management discretion.